L: 92" x W: 39" x H: 40"
Corliss Sofa For a timeless living room with classic appeal, call on the Corliss sofa. This piece will make a grand statement with its generously scaled seating and oversized nailhead trim adorning the ever-stylish rolled arms. The oatmeal-colored fabric is so versatile, and it’s complemented beautifully by bold prints on the accent pillows. Plus, its turned feet are finished in an attractive walnut tone that goes with everything. For a timeless living room with classic appeal, call on the Corliss sofa. This piece will make a grand statement with its generously scaled seating and oversized nailhead trim adorning the ever-stylish rolled arms. The oatmeal-colored fabric is so versatile, and it’s complemented beautifully by bold prints on the accent pillows. Plus, its turned feet are finished in an attractive walnut tone that goes with everything. Couch, loves eat and chair looked beautiful when I first purchased 11 months ago. I'd say about 4-6 months in they all became pilly, "bally", frayed. It is not holding up to everyday use at all. I've purchased many pieces from raymour and flanigan and was happy with all of my previous purchases, But this living room set is NOT one of them. It looks so worn already and the cushions slip out constantly. I have to say it does clean pretty easily but the way it's wearing is totally unacceptable for a couch that's not even a year old. I purchased this sofa in February 2016. Eight months in, I had to call for repair because the seams on the seat cushions separated. A technician came and sewed them together. Now, in April 2017, the same issue came up on a different cushion, I called for a repair and was told my sofa is out of warranty and that the Platinum Protection plan I purchased did not cover this. I feel completely ripped off, the quality of the sofa is terrible and I would not purchase from Raymour Flanigan again. This couch is just as gorgeous as it looks in the picture. The brass detail is perfect. However, the material of the couch can be a bit scratchy on bare skin and the depth of the couch could be a bit deeper... sometimes I take the back cushions off for a better lounging position. Otherwise, this couch will go with any modern/shabby chic decor and really will be the main point of your living space. Fits great in a medium sized apartment. This couch has good back support and yet confy too! Haven't figured out what to do with all of the pillows. Great for day time napping. We are in the process of combining two households AND two styles. This sofa fit both styles perfectly. Back cushions are comfortable and seat cushions more firm. The oatmeal color is the light color I was looking for without being boring beige. The nailhead trim makes it fit a more masculine space. Decorating around this piece has been a breeze. See my loveseat review! Love except seat cushions slide out! I am a R&F employee and I made the best decision when I purchased this set! I love the style, the feel of it but most of all how comfortable the pieces are! The set looks beautiful in my living room and not only do they look good they are soo comfortable! Wish the pillows were a better pattern lol but besides that i love them and love the large buttons on them! Great Purchase! We purchased this sofa last week. It is very well made and very comfortable. Had a party and everyone loved it. Very happy. My husband and I purchased the 3-seater in November, and we love it. We wanted a sofa with more structure and stability to it, so we enjoy the density of these cushions. It's so comfortable and complements our contemporary style townhouse. The seat height with the feet included is perfect for us, as we are a tall family (5'7" and 6"). I love the three cushions, because they are so easy to rotate for maximum lifespan/wear. The fabric is very soft and I love the larger weave of it, too. We love this sofa so much that we came back a few months later to purchase the matching loveseat! I do have to say, though, that the nailhead trim is much more evenly spaced on my loveseat than the sofa. As a graphic designer, this is a bit annoying to see since I'm very detail-oriented. I do wish the nailheads were put in with more care on my sofa. This couch is comfortable and for the price and quality you cannot beat it! The back cushions are very comfortable allowing you to sink in just right. Bottom cushions are a bit firm but not too much. I have had this couch for 2 weeks and I am noticing them breaking in. Seeing reviews about the cushions sliding out I have not had this issue. If you do I am sure you can add Velcro to the bottom. Although, I do not for see that being an issue unless you have children or are being rough with the furniture. This sofa is soft and cuddly. I just bought this sofa to furnish our new house and my family loves it! We are always hosting and my godson feel asleep on it right away. The quality and workmanship is well done! It was my best purchase yet! Beautiful couch & amazing service! This really is a beautiful couch at a great price. It's a bit firm at first but breaks in very quickly and is perfect for curling up on. The customer service from R&F was also amazing. The rep, Barbara, was so patient with my questions, incredibly helpful and just an overall sweetheart. Delivery was also crazy fast and easy. Would absolutely buy more pieces from these guys! I saw this couch on line and dropped in to my local Raymour and Flannigan store (1 mile away) and purchased it within 5 minutes. It's beautiful and comfortable. It's firm but not hard. It looks very well constructed and looks much more expensive than it costs. I've owned it for 3 weeks and although not our primary sofa, it's being used. The accents are great and I happen to really like the pillow patterns. Great purchase for my home. I bought the couch and love seat. I absolutely love them. They not only look classy, but are extremely comfortable as well. I highly recommend this set to anyone. I purchased this entire set and was pleasantly surprised and delighted with the quality and comfort of the entire set. You definitely need a decent size living room for this set but it's absolutely beautiful and well worth the price. Love the way these couches look, but horrible quality. Within 3 weeks the seam started to come apart and fabric started pilling. Called customer care and they said they will send a technician out to repair the seam but nothing can be done about the fabric pilling. I can only imagine how this couch will look a year from now if this is what’s happening after only 3 weeks (and seams are only covered for the first year). Very disappointed, waste of money, I’ve bought cheaper couches held up way better than these. Take my advice, listen to the bad reviews, NOT WORTH IT. Beautiful style but after about 6 months, the couch and loveseat both look about 10 years old. Back cushions misshapen and no amount of rotating can fix it. Furniture Frayed in less than a week. Delivered with paint on the leg and torn fabric. Please stay away!!!! Buy better quality furniture elsewhere! I never leave reviews but I am so mad about this couch. If i sit on the couch I get static shocked all day by everything. My grandkids won't even sit on the couch anymore everyone is afraid of it. Plus it is pilling already and isn't even a year old and the cushions aren't square anymore the foam is moving around in the covers. I just had out the man from Raymour to inspect the couch and what a joke. He sprayed water under neath the cushions and used a pill razor on the top of the material. So MADDDD!!!!! I have lived her for 30 years and had many couches and never had this happen!!! Thank you for sharing your honest review. We're sorry you are having issues with your Corliss Sofa! We would like to get you in touch with our customer care team to see how they can help. Someone will reach out to you shortly! great looking sofa but the cushions constantly slide and move. Very nice ottoman and great value with the sale! Service and delivery were flawless! This set has added such a classy look to our space. Love the color, the wooden feet... no regrets! The delivery guys were absolutely wonderful! Very polite! My husband & I got this sofa with the chair for our new home. It is such a fresh, classic, & very comfortable set. We love it & get constant compliments on it. Very happy with this purchase. I have the 2 couches exactly 3 days...so all I can comment on is the salesman(who was great),the delivery( which was great)and the price ( which was very fair).I'm waiting for delivery of a chair..As far as the structure of the couches or how the upholstery holds up ,I really can't tell at this point. Well made and very comfortable. I agree that the pillows could have nicer patterns, but they are easily replaced. Looks terrific in front of the TV. This couch was very economical and was delivered in record time. It looks great, feels wonderful when sitting on it and the material fits our room perfectly. Your salesman could not have been any nicer. Dealing with Raymour and Flanagan a pleasure. Great sofa for cozy chic decorating, firm seat yet very comfortable. So comfy, pillows soft but firm. Love the details. This is exactly the sofa I was hoping for, giving the living room a semi-formal look but relaxed at the same time. The fabric has a linen feel, and the sofa itself is long in length. I like the oatmeal color as well. Really nice couch for the price. Very comfortable and looks great in the living room. I had been searching for a sofa for quite a while. I saw this one in an ad and thought I would take a look at it. Sometimes furniture looks beautiful in pictures but not comfortable or looks different in person. This sofa actually looked better that the picture and it is very comfortable. Firm but cozy. Love the nailhead detail as it sets this sofa apart from the same old style. The back pillows are removable for cleaning but fit very tightly to the back of the sofa for a nice clean look. The accent pillows are very firm and well made. This product is amazing! Great price! And delivered right on time and to our door. Pillows are sooo comfortable. We love our new sofa! Our first experience at Raymour & Flanigan was good and we shall be back if we need anymore furniture. This couch is made with really bad material. It was a beautiful set (couch and love seat), when we first got it, but now its covered in pulls and there’s no way to properly clean the arms. So now my cushions no longer match their frame. Also the back cushions lost their structure and look really crappy. We have had them for 2 years and are on the hunt for better material more structured couches. What a disappointment . I wouldn’t recommend these unless you are putting them in a room where they won’t be used. My wife loved how this couch looked in the store, but after just a few months it frayed and the cushioning got tattered looking. The arm rest cushioning wore to nothing and the arm rest broke. We called the Wilkes-Barre store, and they told us the plan we bought, which cost extra, didn't cover the damage. Disappointed in the quality of the couch and coverage plan. BEWARE!! Looks good but POOR Quality!!!! BEWARE! Poor quality couch. 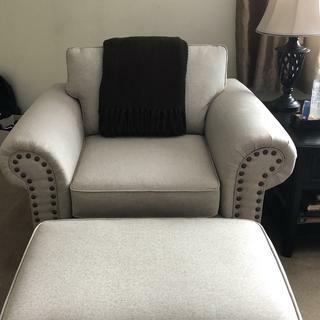 I loved the look of this couch and thought the material was study but exactly 3 weeks after purchasing this sofa, there was a rip in the seam of the center cushion on top. Also the right side suchion seat has flattened. There are 3 people in my household and the heaviest person is 185lbs. When I called Customer support, they said they will send someone to inspect. I will keep eveyone posted on the outcome, just beware becuse raymour and flangian does not accept returns once you accept delivery!!! They have a 3 day rule which they might honor but even that is questionable. We’ve had a great experience with raymour and Flanigan furniture, but this couch was disappointing. In just a year, it went from looking beautiful like the pictures, to the fabric being completely pilled and worn out, cushions misshapen and lumpy, bottom cushions completely crushed in (we got the sleeper, which i think didn’t help with the cushions falling in, plus the few times we had people stay over, they preferred just sleeping on the couch to the sleeper so it was a bad choice on our part) thankfully we got the platinum protection plan, and though it took a lot of back and forth, we finally got credit towards a new couch. We are going to be spending a lot more with the delivery fees etc and a higher priced couch to upgrade, but I think the fact is we just have to spend more for a higher quality couch. We are going with the Diana because there are no cushions and it seems like there’s no chance it will get misshapen, and it will still go with the arm chair of this set if we change out the accent pilllow. The arm chair has held up much better. If you want a couch that will last 5 years or more, this is not the one. I purchased my couch with a warranty and it starting pilling within the first six months someone came out to inspect it. I was contacted and was told if they replace it I lose my warranty. 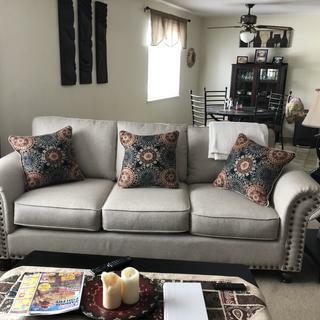 The couch came and I decided to cover the cushions to avoid the pilling to no avail pilling like crazy so I contacted Raymour and Flanigan and was told I was a few weeks over the manufacture warranty and I will have to pay to have the cushions replaced! Never again will I purchase from this company! Horrible customer service POOR QUALITY!! WORST COUCH EVER!! ITS CHEAP FOR A REASON, DON'T WASTE YOUR MONEY!! SEAT CUSHIONS ARE UNCOMFORTABLE AND WORSE, THEY DON'T STAY IN PLACE, YOU GAVE TO CONSTANTLY PICK UP BACK CUSHIONS AND PUSH SEAT CUSHIONS BACK!! HORRIBLE!! I purchased this sofa and the matching chair for my living room. I absolutely love it. I already knew I wanted a cream colored sofa - something light for the room and I wanted something that was structured, looked nice but not formal. I saw this in the Raymore and Flanigan catalog that came in the mail and thought maybe that was what I wanted but I still looked around to see if something else might be better. This sofa is a little closer to an oatmeal color but still works with the wall color I chose. It's definitely a firm couch - which keeps it looking nice and not frumpy. My son is grown and I no longer have pets but I would still be hesitant to put this in my family room because of the light color - at least not without the protection plan! I am extremely pleased with my choice and got lots of compliments on it when I had family over. I love this set! It looks so nice and is firm but comfortable. r the seat cushions reversible ? Are seat and back cushions removable? What "kind" of fabric is this? Linen, velvet, microfiber, microsuede? BEST ANSWER: The upholstery is 100% Polypropylene, which is a heavy polyester. A complimentary fabric sample is available to order by clicking, "Order Swatch" beneath the name and next to the stars on the web site. BEST ANSWER: The frame is made of hardwood and furniture-grade plywood frame materials and reinforced with corner blocks and heavy-duty metal fasteners, screws and glue for added strength and stability. What are the Corliss sofa cushions filled with? BEST ANSWER: The Corliss sofa cushions are fiber-wrapped foam. BEST ANSWER: Please contact our online sales team at 866.383.4484, option 3, there they will be able to best assist you with the pricing and purchasing of these cushions. We bought this sofa last year May and when we sit now, we feel that we are kind of sinking. The sofa is not tough as it was when we bought it. I was wondering if the spring below has issues. Was wondering if you could fix this issue? Are the back cushions attached or are they loose? BEST ANSWER: The cushions on the sofa are removable. They cushions are removable with a hard-slanted back behind them. All of the cushions are loose. If not satifiesd after delivery, can we return the sofas ? is there any fee for returning ? will this sofa fit through a door opening of 35 inches? BEST ANSWER: The Corliss Sofa will fit through a door opening of 35 inches. Who makes this furniture please? BEST ANSWER: The Corliss collection is made by Fusion Furniture. What size rug is best for this sofa? BEST ANSWER: We use a 8 by 10 but you could go bigger and it would still look proportionate. what recliners would go with this set? BEST ANSWER: Our online sales team certainly assist with selecting other furniture to go with this sofa. One of our home furnishing consultants will reach out to you shortly! Does this couch have a high back, I don't like couch's that you fall way back into it.? BEST ANSWER: The Corliss Sofa includes a height from the seat to the top of the back of 17" and a seat depth of 23". To determine if this is the correct sofa for you, we recommend visiting your local Raymour & Flanigan showroom, or please feel free to call us at 866-383-4484, option 3. Will this fit through a 30 inch door opening? BEST ANSWER: Although every delivery situation is different, with the feet and back cushions removed, the Corliss Sofa should fit through a 30" door opening. What is the double rub count on the fabric? BEST ANSWER: The count for double rubs on the upholstery for the Corliss Sofa is 15,000.
do the pillows come with couch and can you get them in different fabric colors? BEST ANSWER: The pillows in the image are included with the Corliss Sofa. There is not an option to order different fabric for them. Does this sofa come in other fabrics? BEST ANSWER: The Corliss Sofa is available in the upholstery shown only. Does the couch come with recliner options? BEST ANSWER: The Corliss Sofa does not include recliner options. What is the name of carpet shown? BEST ANSWER: The pillows on the Corliss Sofa are 17" X 17". I have pets, can plastic covers be made for this sofa before it is delivered? BEST ANSWER: No, I'm we do not provide plastic sofa covers. They may be available to purchase at a local department or home improvement store or online. Can I get this in Brown or chocolate? BEST ANSWER: The Corliss Sofa is available in the Oatmeal/Walnut upholstery as shown only. can you change the fabric of this sofa? BEST ANSWER: The Corliss Sofa includes the upholstery option as displayed only. Does the Corliss sofa come in any other fabrics? BEST ANSWER: The Corliss is not offered in any other fabrics.